Mutants have popped up in Tokyo. These mutants are the relatives of gods and upon consuming human blood they transform into their awakened state which resembles the god that they are related to. Hachi has a nose as good as any dog's. After his best friend is attacked by a mutant he drinks her blood in order to save her. What will Hachi transform into? Will he be able to stop the mutant attack on Tokyo? 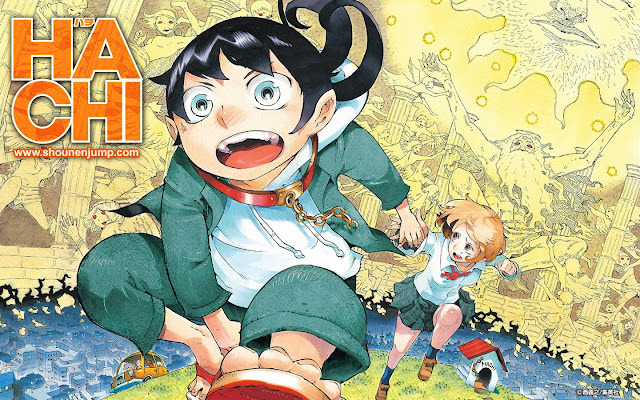 Hachi began serialisation in issue 42 of Weekly Shonen Jump by Yoshiyuki Nishi, the creator of series "Bokke-san" and "Muhyo and Roji's Bureau of Supernatural Investigation". It was not surprising that Hachi was a supernatural manga series, as Nishi had previously done series with the supernatural element. I was left disappointed after reading the first two chapters of Hachi. The basic idea was sound but the way it was portrayed seem more like it was done by a rookie and not a experienced mangaka like Nishi. The character design of Hachi is pretty poor, but when you consider his transformation as a "Half", then you can accept the snotty midget. My opinion of Hachi changed after reading the end of chapter 3. The story seemed to get more interesting with the appearance of the 23 palaces, if you forget the 6 month time-skip. I have no idea what Nishi has planned for the rest of the series, but one possibility is "I will conquer each of the 23 palaces!". I agree that Hachi has a lot of potential. But as I mentioned above, it is slow to get into the action. Have you read chapter 1 of Iron Knight? Hachi is good, not brilliant but it now has a rival, so readers will now choose which of the two they prefer.